I don’t need a day to celebrate my love affair with meat pot pies. But it you give me one, I’ll take it. September 23rd is National Great American Pot Pie Day. Urban legend points to the pie maker and frozen food manufacturer Marie Callender’s as the source of crowning this crust filled observance. And speaking of crust, it’s the very best part of the pot pie. 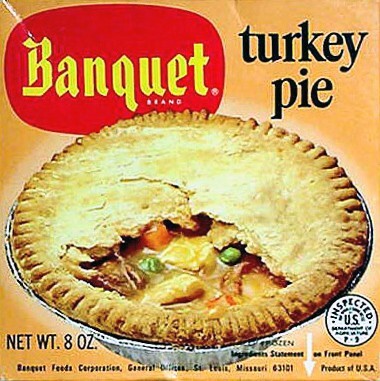 I remember how Mom would occasionally stock our freezer with frozen Banquet turkey and chicken pot pies. They were packaged in a gold and red box that made my taste buds weep. We would pop that aluminum pot pie tray into the oven and it seemed like it took ages for it get done. And if you took it out too soon, the crust at the bottom would be soggy. But it didn’t matter, we ate them anyway. Between that golden brown, flaky double crust delight was tender chunks of meat and vegetables mixed in a delicate gravy. They were such a treat and not to mention these little pot pies gave mom a day off from serious cooking. To this day I love pot pies. 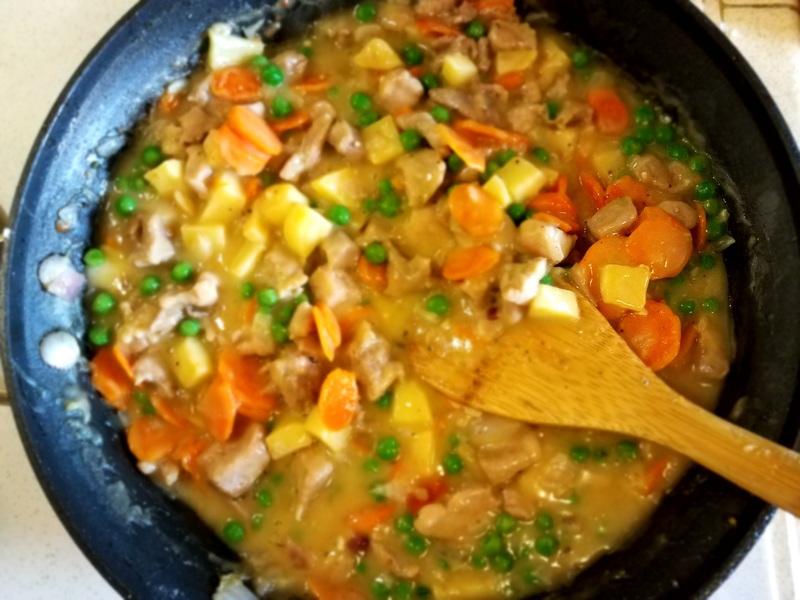 And for years I have made and served a modified version of a turkey pot pie. It’s made in a casserole dish and has a single, puff pastry crust. I’ve posted pictures of it on my social media pages. But I’ve never published the recipe – until now. While the flaky puff pastry crust is definitely the star, the filling is deliciously satisfying and flavorful. Using turkey thigh meat makes it hearty. And the Jersey sweet potatoes and fresh rosemary elevates the dish to something you’ll be proud to serve company. 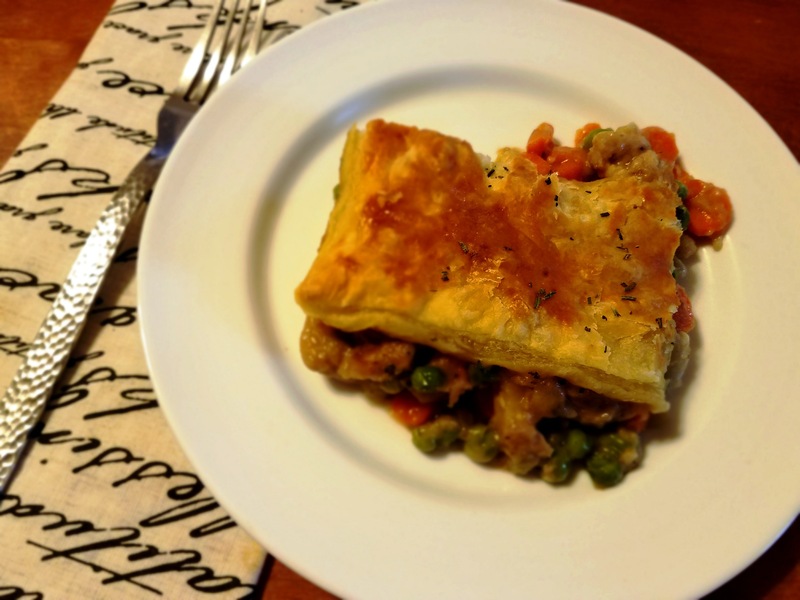 Enjoy National Great American Pot Pie Day and enjoy this recipe any day you want that down home pot pie flavor minus the gold and red box of course. 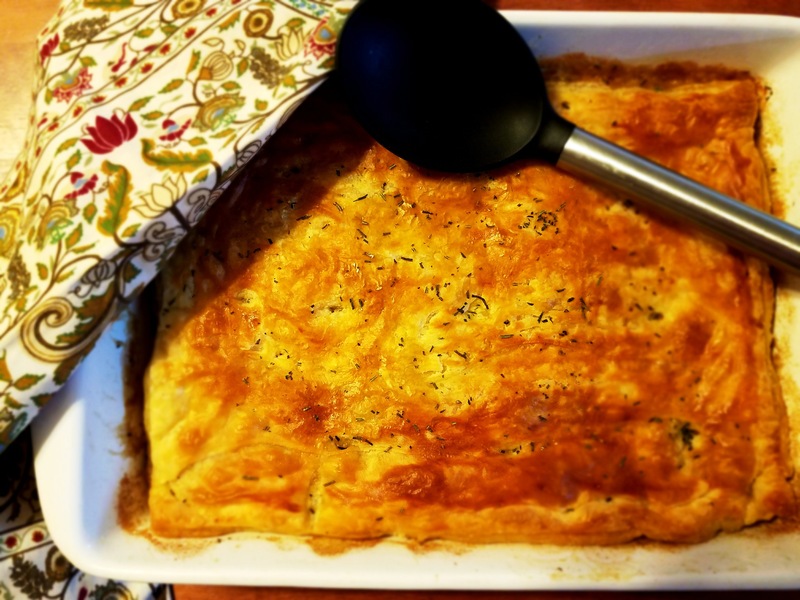 It’s made in a casserole dish and has a single, puff pastry crust. Preheat oven to 375 degrees Fahrenheit. 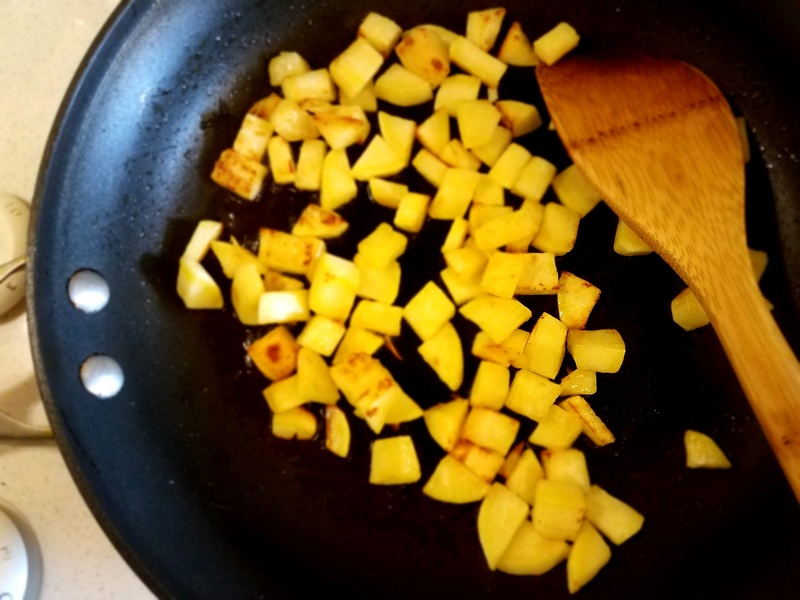 Add 1 tablespoon of oil to a non-stick skillet set at medium heat. When oil is hot, add Jersey sweet potatoes and cook 5-6 minutes, stirring constantly with a wooden spoon or spatula. They will be slightly browned. Remember, color equals flavor. When done, place in a separate bowl or plate. To that same skillet, add about a teaspoon more of oil and add sliced carrots. Cook 2-3 minutes, stirring constantly with a wooden spoon or spatula. When done, place cooked carrots in a bowl or plate with sweet potatoes. Wash and pat dry turkey thigh. Cut in 1 inch pieces/chunks. 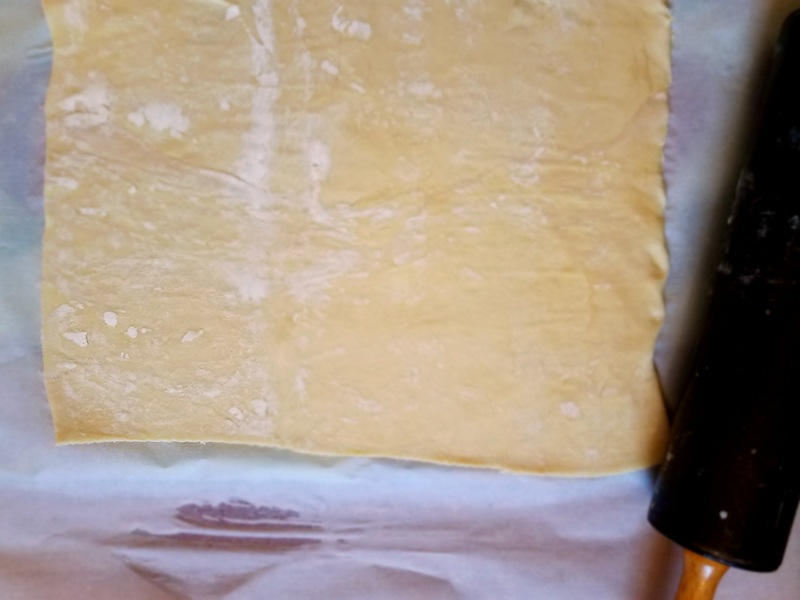 Place cut meat on waxed paper or parchment paper. Generously season with salt, pepper and garlic powder to your taste. Sprinkle 2 tablespoons of flour over turkey meat and mix well. Add 2-3 tablespoon of oil to that same skillet set medium heat. When oil is hot, add turkey thigh meat. Cook 5 minutes, stirring constantly until done. Add the cooked meat to the sweet potatoes and carrots in your separate bowl or plate. To that same skillet, add another teaspoon of oil, onions, garlic and 1 teaspoon of rosemary. Sauté for 1 minute. Add 4 tablespoons of flour and 3 tablespoons of oil. Mix well, stirring for a minute until flour is well incorporated. 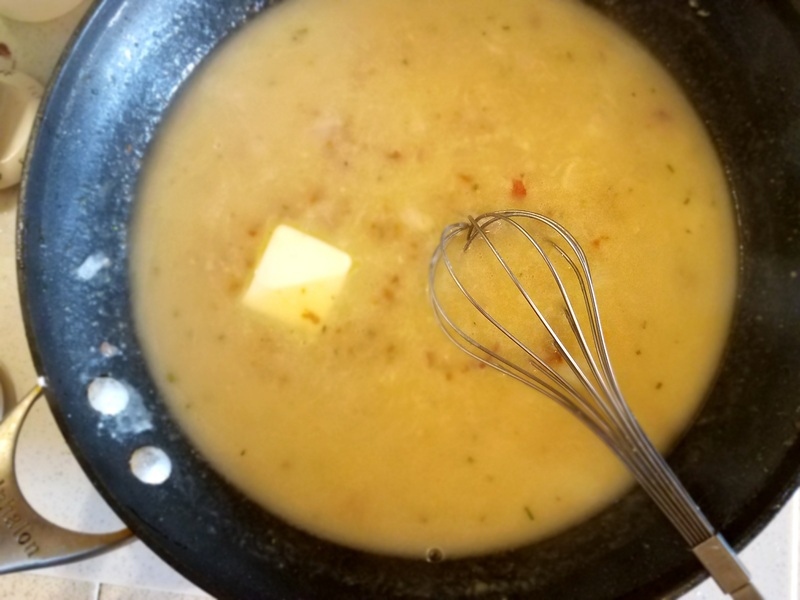 Whisk or stir in 2 ½ cups of chicken stock into flour mixture and mix well. Add 1 tablespoon of butter. Turn down the heat and simmer 2 minutes or until the mixture begins to thicken. Make sure to stir mixture constantly while simmering. Season with additional salt and pepper to your taste. Add in cooked sweet potatoes, carrots, turkey thigh meat and 1 cup of frozen sweet peas to the thickened stock mixture. Stir well. Pour mixture into a baking dish (13 x 9 used in this recipe) sprayed with non-stick cooking spray. Place one thawed puff pastry on a lightly floured, parchment paper covered surface. With a rolling pen, gently roll out pastry to fit the inside of your baking dish. Roll puff pastry loosely around the rolling pin and ease it on top of the mixture in casserole dish. Lightly press it into place. If pastry is too wide, just press the edges up along the sides of the dish. Lightly the brush the surface with milk or an egg wash. Make 6 to 9 prick marks in pastry with a fork to vent the surface. Sprinkle top with the remaining ½ teaspoon of fresh chopped rosemary. 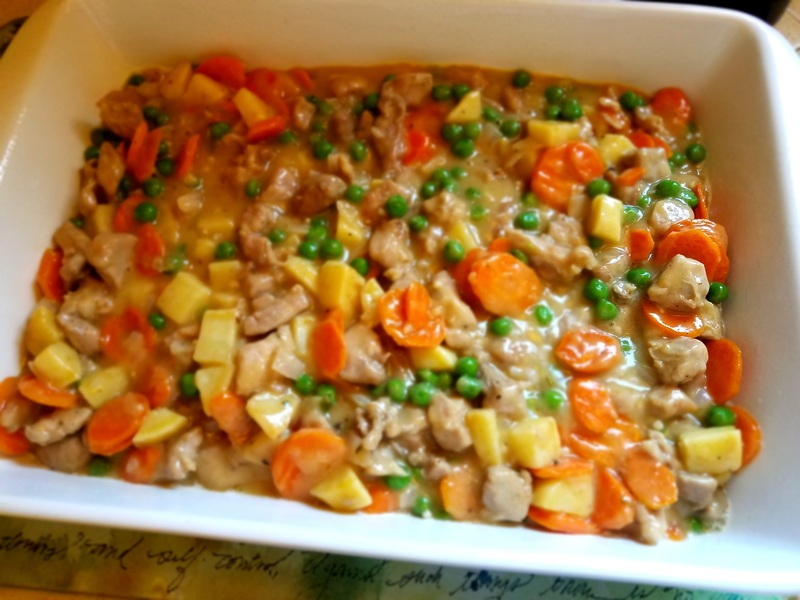 Place casserole dish in oven and bake 25-30 minutes or until crust is golden brown and filling is bubbling. Remove from the oven and cool 20 minutes before serving. Cut into 6 squares. Cook Jersey sweet potatoes 5-6 minutes, stirring constantly with a wooden spoon or spatula. 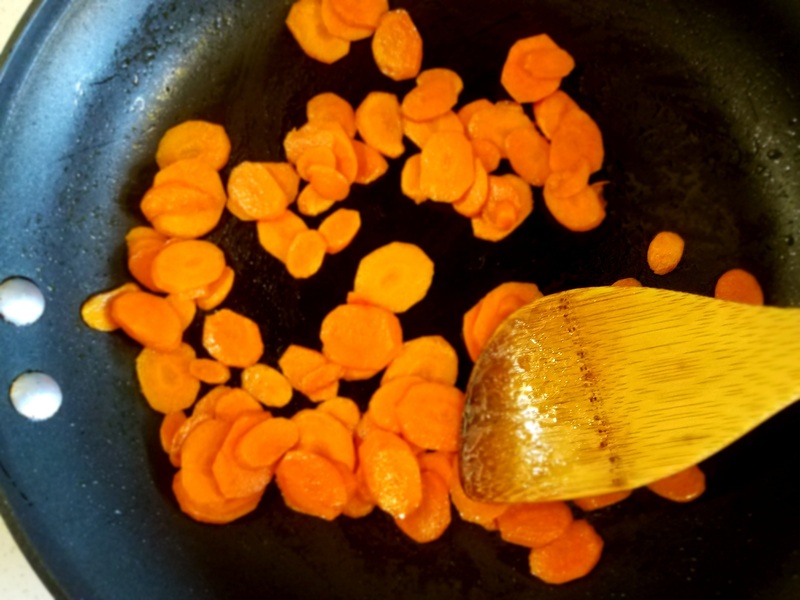 Cook sliced carrots 2-3 minutes, stirring constantly with a wooden spoon or spatula. 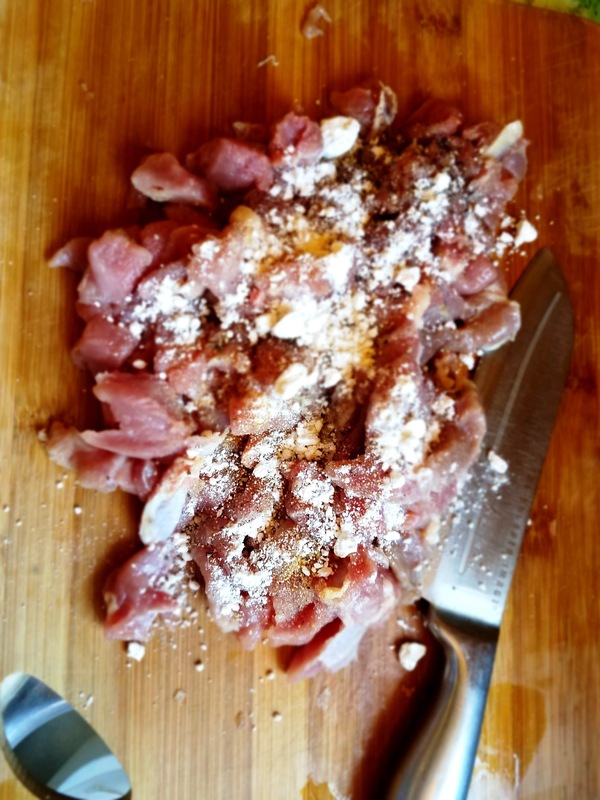 Sprinkle salt, pepper, garlic powder and flour over turkey meat and mix well. 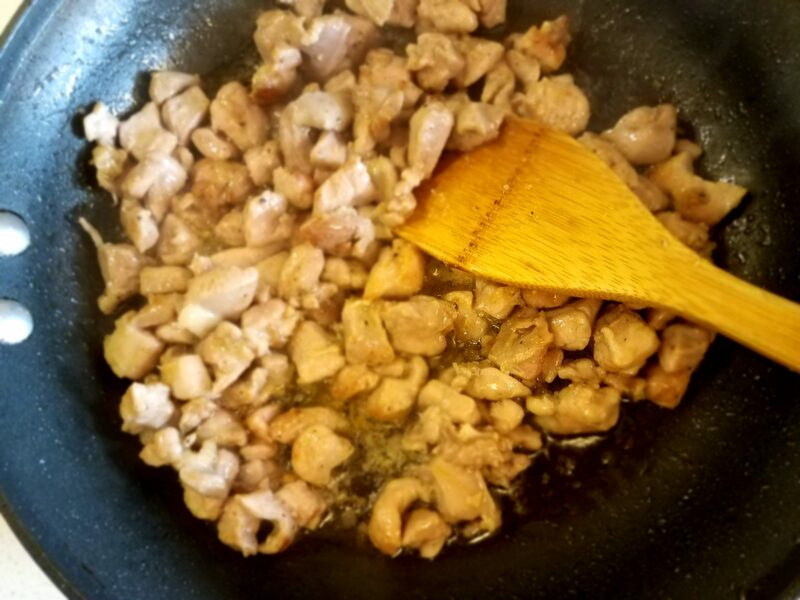 Add turkey thigh meat to a skillet and cook 5 minutes, stirring constantly until done. 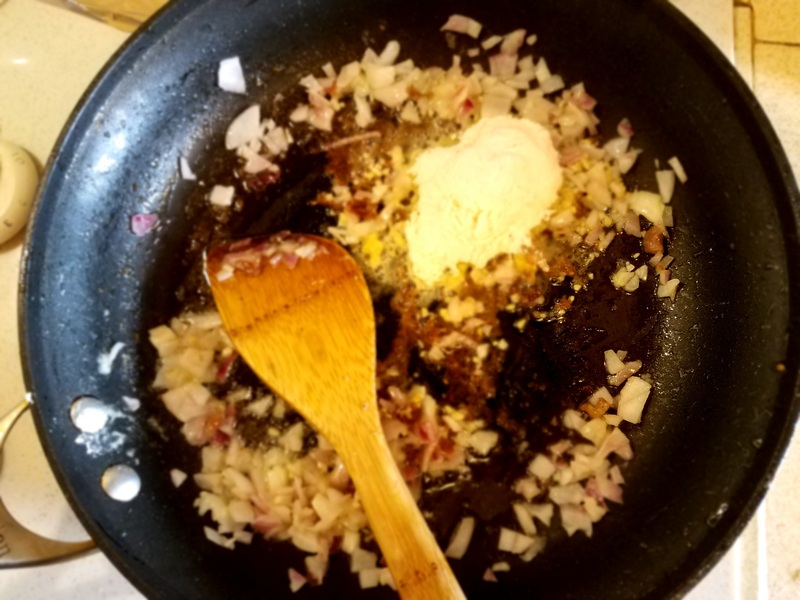 Add flour and oil to sauteed onions and garlic. Whisk or stir in chicken stock into flour mixture and mix well. Add in cooked sweet potatoes, carrots, turkey thigh meat and frozen sweet peas. Pour mixture into a baking dish sprayed with non-stick cooking spray. Gently roll out single sheet of puff pastry to fit the inside of baking dish. 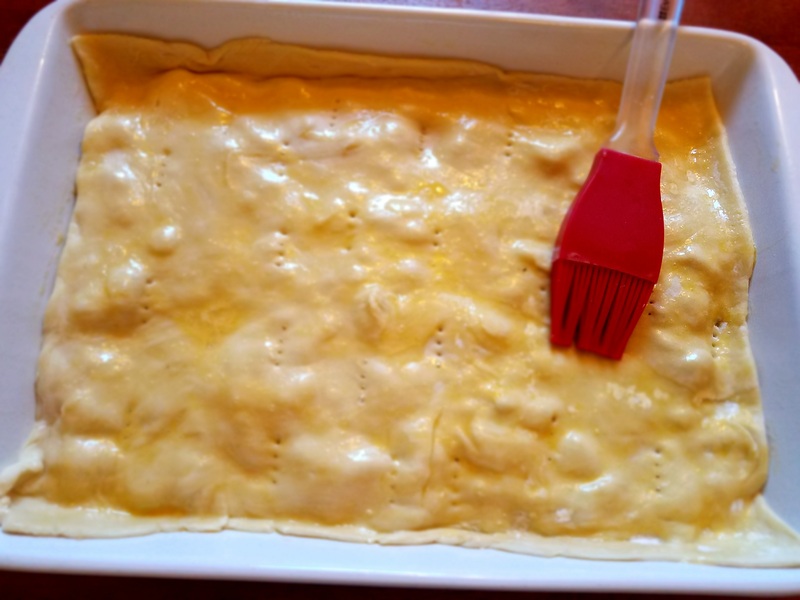 Ease puff pastry on top of the mixture in casserole dish. Lightly press it into place and brush with egg or milk wash.
Cut into 6 or 8 serving squares.